“Want to try a Ramos Fizz?” asked Eliot Hess, a representative for the Craig Corporation, as he pushed a couple of buttons on his hand-held language translator. The display blackened for a moment and then, like a Times Square billboard, began spewing the secret ingredients to a drink I didn’t even know existed. Not only did it tell me I needed such things as one-half teaspoon of orange-flower water; it also told me how to mix and serve the concoction. What business does an exotic drink have in a language translator? Lots, says Hess (millions of dollars of business, in fact), and playing bartender is just one trick these new portable information centers can do. A translator will plan your next dinner, help you choose a wine, and actually speak to a waiter in his native language to order the meal. It will play chess while you’re waiting, teach you a language as you eat—even prescribe medical remedies for the indigestion later. And that’s just the beginning. Now there are new models from which to choose, each with the ability to hold virtually any information you need. Sure, they still translate languages, but even that’s being improved. The newest plans call for increased capability to conjugate verbs, get the proper gender, and even correct syntax through the use of more phrases. But even with advances, language translations are quickly becoming just one of their varied functions. Since our first report [PS, Apr. 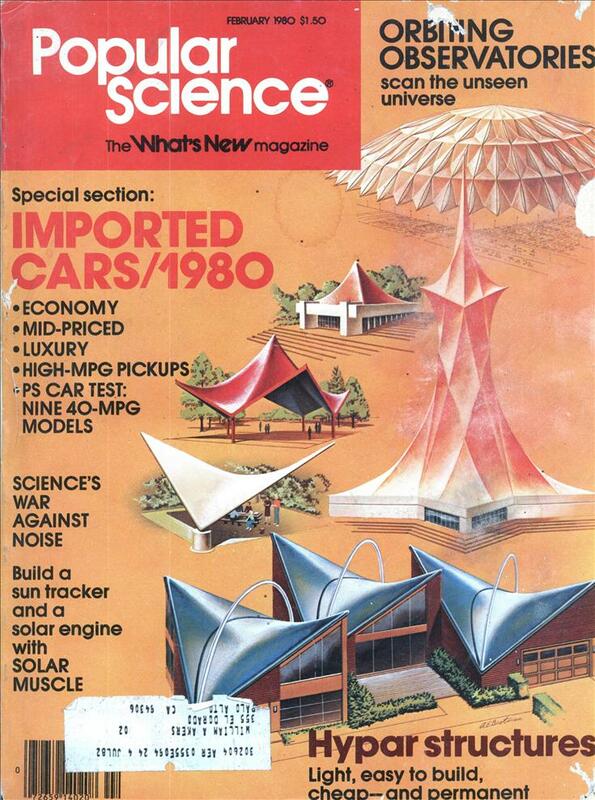 ’79], Craig has been joined by Nixdorf (formerly Lexicon), Sharp, and Texas Instruments, with Panasonic readying a version at this writing. 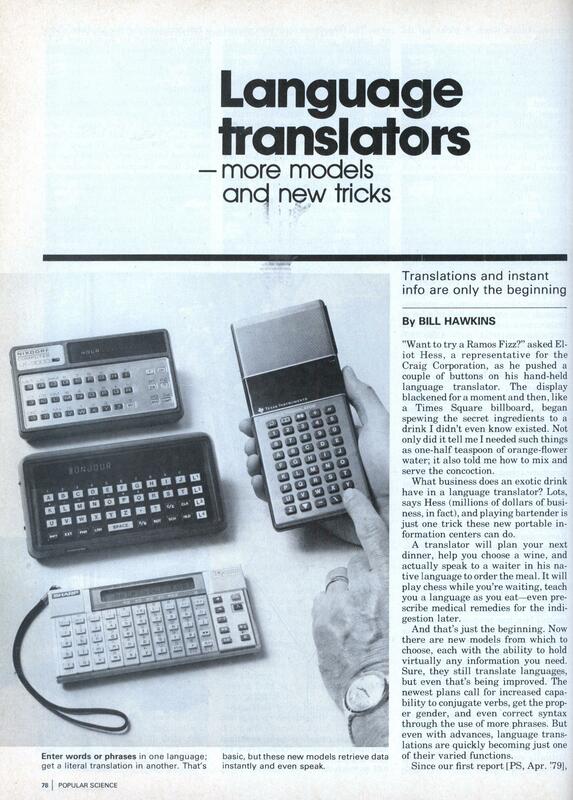 All the translators look and feel like oversize pocket calculators. A keyboard lets you enter your question; a digital display gives you the answer. But the secret to their ability and what can make each one different is in their programming—the individual instructions and raw data used by the translator’s microprocessor. Module mania Like the plug-in cartridges of a video game, these translators are programmed for a specific function with one or more plug-in modules. While one module may teach it the basics of Italian, another may contain statistics on the Olympic games. The modules are the key to the versatility of these machines, so manufacturers are in a frenzy to “digitize” as much data on as many different subjects as possible. For example, besides the bar/wine and diet/nutrition module, the Craig unit will translate Spanish, French, German, Italian, and Japanese liter- ally—and with an additional module, it will display the words phonetically, making it easy for you to say them. The Nixdorf translator accepts French, Spanish, and German modules, along with data modules that let you add your own info if you wish. Plug in the European soccer-league module, for example, and you can update it yourself at the end of the next ball game. The Nixdorf also accepts interface modules. These are special connectors that allow you to attach the unit (directly or by phone) to a large conventional computer. For now, on-the-road salespeople, for example, could use this attachment. And not long from now, a quick connection to your home computer could load the unit with an updated shopping list or your daily appointments. The Texas Instruments’ translator also accepts Spanish, French, and German modules, but what it does with them could make you the envy of any linguist: It talks. Each module contains digital info to represent human phonetic sounds. When put together electronically, they become about 300 spoken words that will make up some 3000 phrases. Now if all this sounds quite incredible, I should tell you that everyone I spoke to emphasized that this is just the start. Future plans from Panasonic, for example, include add-on devices such as a printer or video-display terminal along with educational and game modules. Sharp designers have a speaking translator in the lab, and their present model has a curious dot-matrix display. The designers aren’t talking—in any language—but it could display a lot more than just conventional letters and numbers. At present, the limitation is the memory capacity inside each module, but that’s sure to change. Within just the next couple of months, both Craig and Nixdorf plan to switch to a newer, double-density module. For translations, it means more words and verb conjugations. It could mean virtually anything in the data modules. TI was at the forefront of speech technology at the time. The Speak and Spell was a big hit at that time. Bubble memory really was an over hyped technology that just never went anywhere. Cheaper and and larger silicone memory just pushed it aside. Bubble memory wasn’t very fast either. I work for a company that translates web pages, computer programs, and so on. When this technology is finally perfected, we will all be out of a job along with the hand-loom weavers.